General Omar Bradley, commanding the First U.S. Army, had waited anxiously for the linkup of Omaha and Utah beachheads before declaring success in the American sector following D-Day. He considered this final event critical before the Allied invasion of Europe could be put into full swing. His concern over the linkup delay was confirmed when he received an Ultra flash from British intelligence at Bletchley Park indicating the German high command was aware of a gap existing between the American V and VII Corps. They ordered the 17th SS Panzergrenadier Division to counter attack and split the two forces. It is interesting to note that this was one of the few times that information obtained from the German Enigma Code breaking was deemed so critical it was passed to a tactical commander. Such intelligence had previously been withheld for fear of tipping the Germans to the fact their secret code system had been broken. For days the American Parachute Infantry had been engaged in combat with the German Army's 6th Parachute Regiment in the vicinity of Carentan. It was now D+7, June 13, 1944. "...what a wonderful sight it was to see those tanks pouring it to the Germans with those heavy 50-caliber machine-guns and just plowing straight from our lines into the German hedgerows with all those fresh infantry soldiers marching along beside the tanks," remembers then LT Richard Winters who commanded Easy Company, 506th Regiment of the 101st Airborne Division, "the band of brothers." The scene, which followed, has finally been captured by renowned military artist James Dietz in We Happy Few. Infantry from the National Guard's famed 29th Division, supported by the 2nd Armored Division's "Hell on Wheels," had raced forward to relieve the airborne troops from the 82nd and 101st Airborne Divisions seizing and holding ground since their historic jump on the eve of D-Day. What a joyous occasion it had to be as the American airborne, joined by the grateful French civilians, welcomed the arriving ground troops. Clearly there was a difficult task ahead. Tragically many of the joyous American soldiers depicted in the print would not be there for another happy day, May 8, 1944, some eleven months later when Germany finally surrendered. But for a moment, they were "We few, we happy few." The suffering and sacrifice of the past week was behind them, and they could briefly pause to enjoy a moment in time. 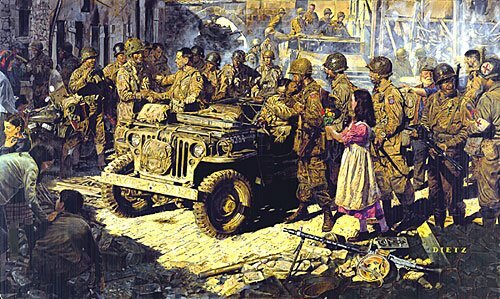 This very historic moment, previously not depicted, is captured here in dramatic detail by the artist whose works continue to capture the American soldier in the best of times and the worst of times. The Band of Brothers is seen swapping tales with the Blue and Gray 29ers from Omaha Beach before heading to defensive positions in Carentan. The tankers of Hell on Wheels share smokes with the "All Americans" before beginning their difficult sweep across France. It is a scene which passed quickly, but is now reborn in the superb detail of this historic print. Generals Eisenhower and Bradley were greatly relieved with the news of the successful linkup. At noon on the next day, July 14, 1944, XIX Corps, comprised of the 29th and 30th Divisions, was formed and ordered to attack south to St. Lo, while protecting the critical area between V and VII Corps. V Corps with the 1st and 2nd Divisions would link up with the British and continue attacking south, while VII Corps with the 4th and newly arrived 9th and 90th Divisions would continue west to capture Cherbourg. Any chance for the Germans to split the corps' seam had been eliminated. The Allies were beyond the beachhead, and Germany's fate had been sealed by American soldiers like those depicted in We Happy Few.